Superstar has just become available on Netflix Watch Instantly. If you have never seen it, please, do yourself the favor of watching one of the most hilarious films in the Saturday Night Live canon. Molly Shannon is at her comic best channeling the spirit of 16-year-old catholic schoolgirl Mary Catherine Gallagher – one of the most memorable characters from her six seasons on SNL. Will Ferrell co-stars as Sky Corrigan, the coolest guy in school and Mary’s crush. Of course Sky is an amazing dancer and Ferrell’s goofball sincerity is charming as usual as he pantomimes through a diversity of dance moves throughout the film. He also shows up as God. Ferrell and Shannon came into SNL together, in the mid-90’s resurgence, and their pairings are some of my favorites. The film is also full of more subtle comedic moments which come from the periphery characters created by a solid ensemble of talented players: Kids in the Hall alum Mark McKinney as Father Ritley, Mary’s exasperated headmaster, the magical Glynis Johns as Mary’s Grandmother and another SNL alum, Harlan Williams, cameos as a dark and mysterious stranger. My favorite is Emmy Laybourne as Mary’s overzealous best friend, Helen. Of course I love this movie because it’s really a teen film – a unique and hilarious teen film. Superstar is a romp through the perils of adolescence with enough camp to make it ridiculous but not unbelievable. Like most young girls in America, Mary dreams of being a “Superstar!” (You know the move). She is exploring her identity and bursting to express herself but does so in awkward and clumsy ways. Her Grandmother has stifled her dreams by forbidding her to perform and insisting she become a businesswomen. At school she is bullied and tormented by mean cheerleaders (Elaine Hendrix is vicious as the queen bee, Evian). Pretty typical adolescence. But, like many of Shannon’s other characters, Mary prevails. She is a woman who knows what she wants. She holds her own and stands up for herself. She remains true to herself. She continues to fight for her dream. And it’s all pretty freaking funny. My new friends at Solo and the Second City graciously re-posted my “For the Fellas” post. Check it out along with rest of their awesome perspectives on being a single gal in Chicago. This is the Snow White story I have been waiting for! Though it barely passes The Bechdel Test this is my favorite feminist film of the year, so far. If the classic Disney fairy tale is your only point of reference for this dark and daring story you might be more comfortable with Disney’s current reimagining, Mirror Mirror. Snow White and The Huntsman is equal parts dark and light, a more accurate reflection of the Grimm’s fairytale than any reimagining since the original story. Kristen Stewart’s Snow White is more comparable to Katniss Everdeen than her original namesake and helps to usher forth what I hope will be the new wave of female adolescent protagonists: passionate, brave and leading with their hearts. Heart is the core of this story: the ways it makes or breaks us and for Snow White, it is her heart that makes her so valuable, both literally and figuratively. The Evil Queen, Ravenna, masterfully played by Charlize Theron, seeks to devour Snow White’s heart in her manic obsession to be the fairest in the land, to remain eternally youthful and beautiful. A provocative script and a seriously riveting performance by Theron elevate Ravenna’s character from the familiar archetype of a villain by giving her: 1. An identity – do you remember the Evil Queen having a name in any other re-telling? 2. A heart, albeit a bruised and bitter one. Taught from a young age that beauty is power and having spent a lifetime subsequently “ruined by men” Ravenna’s humanity makes her the most relatable character in the film. She is more a victim of female gender role backlash than sincerely demonic. Sound familiar? Ravenna’s darkness is juxtaposed by Snow White’s fairness, not just physically but emotionally. Throughout the film Ravenna is the embodiment of natural beauty tainted by the carelessness of the world and, in typical mean girl style, she resents those who find their beauty reflected in the world, such as the fair Snow White. One of the most beautiful elements of the film is Snow White’s relationship to nature, an aspect that was trivialized in the original Disney version where Snow frolicked in the forest, yearning through song about waiting for her Prince to find her. This Snow White is not waiting to be found, she is not hoping to be rescued. She is seeking justice and activating her destiny with no thought for romance. The casting of this film should not go unnoticed among teen and adult audiences. Theron has made her career out of characters that explore the complicated, often ugly side of the female experience. She has long been a favorite of mine but it was last year’s Young Adult, a slice of life story where she tackled the painful consequences of a female life built on beauty and image, that marked her a permanent heroine of mine – brilliant and brave. There are mixed opinions about Kristen Stewart, I hear a lot of people rag her, but she continues to take roles that usurp the traditional trajectory of a young Hollywood actress. She has yet to star in a romantic comedy nor has she been pigeonholed into the stereotypical teen girl image force fed to us by studios predominantly run by men. Often criticized for her awkwardness and emotional blandness, Stewart’s real life resistance to the Hollywood teen idol image serves her character well. As Snow White, who has spent the bulk of her developmental years in solitary confinement after witnessing Ravenna murder her father, Stewart’s interpretation of the character is imbued with an innate understanding of her power and position. She just has to learn how to access it. When she does finally find her voice it is strong enough to rouse a rebellion. Let me be the first to say that the description of this film offered by IMDB, Google and this month’s Elle magazine, which features Stewart on the cover, are inaccurate. Each, in one way or another, summarize the story in a way that suggests the Huntsman protects and mentors Snow White. Um, yeah. That’s not how it happens at all. In fact, there is only one scene where the Huntsman offers guidance on how Snow can protect herself. He instructs Snow White to drive a blade right into her attackers heart and “Don’t remove it until you see their soul.” Responding that she could never do that The Huntsman replies, “You may not have a choice.” Ooooh, feminist foreshadowing. Because, guess what, HuntsMAN? I do have a choice. 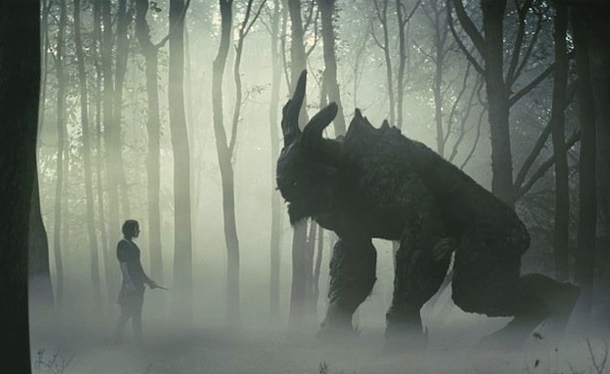 In the scene immediately following the two are attacked by a larger than life troll who knocks the Huntsman unconscious and turns to unleash a powerful roar in Snow White’s face. Snow White responds by roaring right back and they face each other – pausing, staring, and seeing each other’s souls. Is that not what we all long for? To be heard? To be seen? To be allowed to be ourselves without fear of hurt, loss, and abandonment? In truth, it is Snow, with the support of the seven dwarfs (a fun surprise of familiar faces shrunken down in size) who mentors him. Following another archetypical path of the widowed male drowning his sorrow in alcohol and violence, it is Snow White’s fairness – not beauty but commitment to justice that rejuvenate the Huntsman’s desire for life. By being unapologetically vulnerable and insecure, “How do I inspire? How do I lead men?” but brave enough to admit it, Snow White demonstrates the true meaning of strength, of power, of heart. Above all, the most prevalent message in this film, and one of utmost value for female audiences, is the example of leadership modeled by a girl that is simply being herself. We should all be so brave. This movie kind of pissed me off because it put me in a bind that I often find myself in: Story about a teenage girl – awesome! And her relationship with her single, working mom – yes! Directed by a woman – boom! Unfortunately, just like my last relationship, everything looks great on paper but once you’re in it you realize it’s just a big ol’ mess. This is the story of Aniesdad (Cierra Ramirez) a 15 year old girl and the only child of Grace (Eva Mendes). Grace is a self-absorbed waitress who favors time with a married man (Matthew Modine) over spending time with her daughter – or paying bills, grocery shopping, doing laundry. In order to detach from her mother completely, Aniesdad is trying to execute her own initiation into adulthood and does so by staging her own coming of age story through culturally significant yet destructive rites of passage. Ramirez is a refreshing newcomer whose detachment from/desire for her mother’s love is one of the only genuine elements of this film. The actress herself is an actual teenager so maybe this has something to do with the honesty behind her performance. Girl also follows the traditional pattern in young adult female driven stories of the protagonist being disconnected, or somehow estranged, from her mother. While I recognize that struggling against authority and, more or less, hating your Mom is part of the process of being a teenager, I wish there were more films with positive Mom characters. Mom’s who daughters look up to. Mom’s whom daughters admire, despite their flaws. Mom’s who become better because of their relationship to their children. Save for her 5-minute makeover at the end of the film (which I totally didn’t buy! ), Grace is continually selfish and unlikable. Mendes is usually someone I like to watch but here her charm reads as falseness and Grace remains unsympathetic and distant. Writer Hiram Martinez’s attempts to give her some sense of humanity through her struggles at work and fleeting moments of motherly affection don’t translate. This is a film about a struggling single mom the way Bad Teacher was a film about a struggling high school teacher. Not really. At all. Moments like these make me wonder if it is possible for men to write honest female characters. It doesn’t happen often and certainly didn’t here. Something I found to be really careless about the film was its attitude towards dating violence. Rated PG-13, and billed as a Comedy/Drama, the target audience for this film is clearly high school girls. Considering that approximately 1 in 5 female high school students report being physically and/or sexually abused by a dating partner, and these numbers are even higher in Latina populations, I think Martinez could’ve opted out of lines like “Becky can’t come to work; she had a fight with a flight of stairs” when referring to one of the waitresses at the restaurant where Grace works. Certainly, director Patricia Riggin could’ve made a different choice. More disturbing than the careless dialogue are the interactions between Tavita (Raini Rodriguez), Aniesdad’s best friend, and the boy who tells her “I’m not your boyfriend no matter what we do in your basement.” He shoves her at one point and grabs Aniesdad at another. It happens so casually and it is just accepted by both the characters. If it’s a subversive choice by the filmmakers, I missed. I just found it upsetting. Girl In Progress does manage to usurp the tradition of providing young female characters with male role models. Aniesdad seeks guidance from her English teacher; a surprising appearance by Patricia Arquette and Grace is treated with dignity by the wife of the man with whom she’s having an affair. The woman politely and privately lets her know she’s fired yet still acts with empathy towards Aniesdad. This was a refreshing choice even if it was totally unbelievable that Matthew Modine, his character or the real him, would ever end up with either of these women. And, even though there was very little attention given to heritage or cultural experiences, it was nice to watch a film with some non-white faces. Overall, the film was much more mature than the creators were prepared for. It raises the question of some serious issues facing teenagers that can affect the type of adults they become. The film was released on Mother’s Day and I only hope that the mothers who saw this film with their daughters are also having conversations about the realities of coming of age. Telling them that you can’t create or even choose the experiences that make you an adult; it happens when you least expect it and in ways that are harsh, scary, and beautiful. I hope those same mothers, unlike Grace, are allowing their daughters to see their vulnerabilities and their strengths because as we grown-ups know, this life isn’t so easy. And the line between childhood and adulthood isn’t so clearly defined.